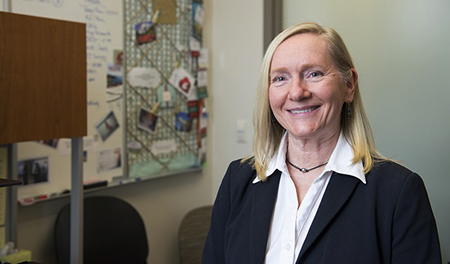 But new research led by Marian Wilson, Ph.D., of the Washington State University College of Nursing found that frequent marijuana use seems to strengthen the relationship between pain and depression and anxiety, not ease it. The research, recently published in the journal Addictive Behaviors, involved 150 patients being seen at an opioid treatment clinic. Previous studies have shown that nearly two-thirds of patients receiving medication-assisted treatment for opioid addiction also have chronic pain, and many experience depression and anxiety. About 67 percent of the clinic patients surveyed by Wilson and her team said they had used marijuana in the past month. Research by Wilson, WSU College of Nursing, shows that frequent marijuana use seems to strengthen the relationship between pain and depression and anxiety. “Some are admitting they use it just for recreation purposes, but a large number are saying they use it to help with pain, sleep, and their mood,” Wilson said. “We don’t have evidence with this study that cannabis is helping with those issues.” In fact, the relationship between pain and depression and anxiety increased with the frequency of marijuana use. In most cases, people reported they were self-medicating with marijuana, Wilson noted, yet only a small number had a medical marijuana card. The study noted that opioid overdose rates have more than tripled in the past two decades and are now the second-leading cause of accidental death in the United States. There are many questions about the relationship between marijuana use and opioid addiction and treatment – such as why opioid death rates are 25 percent lower in states that have legalized medical marijuana – but the primary purpose of Wilson’s study was to see whether cannabis use affects the relationship between pain and depression and anxiety. Patients believe using marijuana helps them with their symptoms, but the study’s results could indicate the opposite is true for those in addiction treatment – that by strengthening the connection between feelings of pain and emotional distress, it makes it harder for them to manage their symptoms. “The effectiveness of cannabis for relieving distressing symptoms remains mixed and requires further research,” the study concludes.